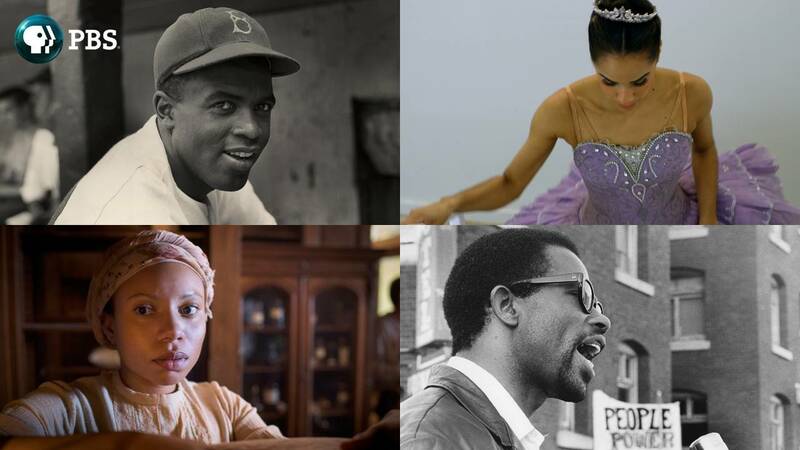 Top left: Jackie Robinson, Courtesy of Hulton Archive Getty Images; Top right: Misty Copeland, Courtesy of Urban Romances, Inc; Bottom left: MERCY STREET’s Aurelia Johnson (Shalita Grant), Courtesy of Antony Platt/PBS; Bottom right: THE BLACK PANTHERS Eldridge Cleaver, Berkeley, Courtesy of Jeffrey Blankfort. ARLINGTON, VA – JANUARY 13, 2016 – PBS is highlighting the African-American experience through content on air on PBS member stations, online through the PBS Black Culture Connection and through a series of community conversations that will engage viewers in an exploration of African-American history and culture. In addition to documentaries airing in February featuring those who helped influence integration and inclusion, throughout 2016 PBS will also feature programs about moments in history that helped shape race relations today. See a clip here. Directed and produced by award-winning filmmaker Stanley Nelson and recently completing a theatrical run, THE BLACK PANTHERS: VANGUARD OF THE REVOLUTION from INDEPENDENT LENS will air on February 16 and be featured at PBS’ presentations during the Television Critics Association Press Tour in Pasadena, CA, on January 19. The film explores the history of the Black Panthers, a revolutionary political party originally created in 1966 to combat policy brutality towards blacks in Oakland, CA, but which expanded nationwide throughout the late 60s and 70s, paving the way for many of the radical social movements of the time. Airing the same week that Major League Baseball celebrates a day in his honor, on Monday, April 11, PBS airs Ken Burns’s JACKIE ROBINSON, which examines the life and times of Jack Roosevelt Robinson, who in 1947 lifted a nation and an entire race on his shoulders when he crossed baseball’s color line. Burns reveals fascinating stories about the legend’s life on and off the field, and will be joined by Robinson’s widow, Rachel Robinson, during PBS’ panel presentation at the Television Critics Association Press Tour on January 18. And this fall, Henry Louis Gates, Jr. explores the last 50 years of African-American history, from the victories of the Civil Rights Movement to the first black president, asking profound questions about the state of black America — and the nation as a whole in BLACK AMERICA SINCE MLK: AND STILL I RISE. To honor Black History Month, and as part of its commitment to celebrating the diversity of America year-round, the PBS programming schedule features documentaries from award-winning producers that shine a brighter light on the different experiences of several notable African Americans who brought about change. INDEPENDENT LENS “A Ballerina’s Tale” on February 8 takes an intimate look at Misty Copeland, American Ballet Theater’s first African-American female principal dancer. The documentary examines her emergence as a pop culture star despite the absence of women of color at major ballet companies, while simultaneously dealing with an injury that almost ruined her career. In B.B. KING: AMERICAN MASTERS on February 12, viewers will learn more about the challenges he faced through candid interviews filmed shortly before his death. Also from AMERICAN MASTERS on February 26, a documentary about FATS DOMINO tells how his music helped influence integration during the Civil Rights era. On February 29, INDEPENDENT LENS presents “Wilhemina’s War,” which shows the devastating toll of the scourge of HIV/AIDS, one of the leading causes of death for black women in the rural south. The film is set against the backdrop of political events in South Carolina. Returning for its third season, FINDING YOUR ROOTS from Professor Henry Louis Gates Jr. explores the genealogy of famous Americans, including Donna Brazile, Kara Walker, Maya Rudolph, Shonda Rhimes, Keenen Ivory Wayans, Sean Combs and LL Cool J, airing through March 8. Also of note, this month PBS debuts its original series MERCY STREET (January 17 at 10:00 p.m. ET), a Civil War-era drama about the chaotic world of Union-occupied Alexandria, Virginia, and the Mansion House Hospital in the early years of the Civil War. The scripted drama explores, among other topics, the role that African Americans —including slaves, free blacks and contraband (African Americans who fled slavery in the hope of securing their freedom behind Union lines) — played in the hospital and the city. Among the African-American characters included in MERCY STREET are Samuel Diggs (McKinley Belcher III), a free black laborer, and Aurelia Johnson (Shalita Grant), a contraband laundress, who each experience their own struggles as employees of the hospital. In many ways, their trials parallel issues and topics that African Americans still experience today, such as oppression, violence against women, education and poverty. In addition to on-air programs, the PBS Black Culture Connection (BCC), an extension of PBS.org featuring black films, stories and discussion across PBS, will turn the lens on viewers, asking them to share their own personal stories and experiences of how black history and culture influences their lives — directly from their point of view. Inspired by a word — ideas, people, expressions and adjectives — released every day in the month of February, the campaign #MyBlackHistoryMonth asks viewers to interpret these words into stories using a single photo, which will be made into a living collage to be preserved on pbs.org. Viewers are also encouraged to stream our catalogue of more than 30 programs available on the BCC. Join Harvard scholar Henry Louis Gates, Jr. as he delves into the genealogy of 27 new guests. Each story illuminates the vast patchwork of ethnicity, race and experience that makes up the fabric of America. Follow a colorful cast of characters — doctors, nurses, contraband laborers and Southern loyalists — who intersect in the chaotic world of Union-occupied Alexandria, Virginia, and the Mansion House Hospital in the early years of the Civil War. Explore the rise of Misty Copeland, who made history as the first African-American female principal dancer with the prestigious American Ballet Theater. Get an intimate look at this groundbreaking dancer during a crucial period in her life. Discover how Fats Domino’s brand of New Orleans rhythm and blues became rock ’n’ roll. As popular in the 1950s as Elvis Presley, Domino suffered degradations in the pre-civil rights South and aided integration through his influential music. A Southern grandmother struggles to help her family through the scourge of HIV, but may be unable to save those she loves. AIDS is one of the leading causes of death for black women in the rural south, where living with HIV is a grim reality. Learn the story of the pioneering African-American photographers — men and women, celebrated and anonymous — who have recorded the lives and aspirations of generations, from slavery to the present. Follow Muhammad Ali’s path from a gym in Louisville to boxing successes, conversion to Islam, opposition to the draft, exile from the ring, comeback fights, Parkinson’s disease and his inspirational re-emergence at the Atlanta Olympics. Follow Young’s journey from segregated Kentucky to head of the National Urban League. Unique among black leaders, he took the fight directly to the powerful white elite, gaining allies in business and government, including three presidents. Explore the life and legacy of the playwright some call America’s Shakespeare, who chronicled the 20th-century black experience. Features James Earl Jones, Phylicia Rashad, Laurence Fishburne, Viola Davis, new dramatic readings and rare footage. Most famous for her seminal novel The Color Purple, writer/activist Alice Walker is the first African-American woman to win a Pulitzer Prize for Fiction. Her dramatic life is told with poetry and lyricism. Survey the full sweep of African-American history, from the origins of slavery on the African continent through more than four centuries of remarkable historic events up to the present. Presented and written by Harvard scholar Henry Louis Gates, Jr. Explore experiences that created the African-Americans. The episode portrays the earliest Africans to arrive on these shores, traces the emergence of plantation slavery and examines what late 18th-century revolutions meant for African Americans. See how black lives changed dramatically in the aftermath of the American Revolution. For free blacks, the years were a time of opportunity, but for most African Americans, the era represented a new nadir. Slavery intensified, but so did resistance. Examine the most tumultuous period in African-American history: the Civil War and the end of slavery and Reconstruction’s thrilling but brief promise. Shortly after emancipation, the South mounted a campaign of terror to restore white supremacy. Examine the Jim Crow era, when blacks struggled within the confines of segregation. At the turn of the 20th century, many left the South for the North. The “Harlem Renaissance” redefined how America saw African Americans — and how they saw themselves. After 1968, African Americans set out to build on the civil rights movement’s victories, but class disparity threatened the community. By Obama’s second election, it was clear many issues, including true racial equality, remain to be resolved. PBS LearningMedia — PBS’ destination for educators and students — offers a range of curriculum-targeted resources that support lessons on black history and spotlight the leaders, thinkers and innovators that helped shape our nation’s history. Through discussion questions, worksheets, videos and digitized primary sources, PBS LearningMedia helps teachers to promote inquiry in their classrooms and strengthen students’ personal connection to black history and culture. For more information on the latest digital resources for classroom instruction, please visit pbslearningmedia.org. PBS, with its 350 member stations, offers all Americans the opportunity to explore new ideas and new worlds through television and online content. Each month, PBS reaches nearly 103 million people through television and over 33 million people online, inviting them to experience the worlds of science, history, nature and public affairs; to hear diverse viewpoints; and to take front row seats to world-class drama and performances. PBS’ broad array of programs has been consistently honored by the industry’s most coveted award competitions. Teachers of children from pre-K through 12th grade turn to PBS for digital content and services that help bring classroom lessons to life. PBS’ premier children’s TV programming and its website, pbskids.org, are parents’ and teachers’ most trusted partners in inspiring and nurturing curiosity and love of learning in children. More information about PBS is available at www.pbs.org, one of the leading dot-org websites on the Internet, or by following PBS on Twitter,Facebook or through our apps for mobile devices. Specific program information and updates for press are available at pbs.org/pressroom or by following PBS Pressroom on Twitter.